Birchgrey Ltd. Sporting Promotions Wimbledon, London. 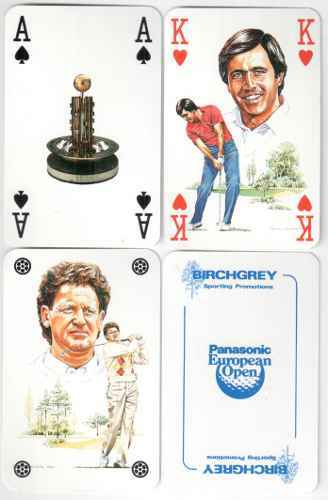 'Panasonic European Open' non standard pl;aying cards with each court card depicting a leading Professional Golf Association (PGA) European Tour member who has either won or featured prominently in the Birchgrey promoted championship. Nick Faldo, Severiano Ballesteros etc. 56 cards includes 3 Jokers and on e extra card. As new. 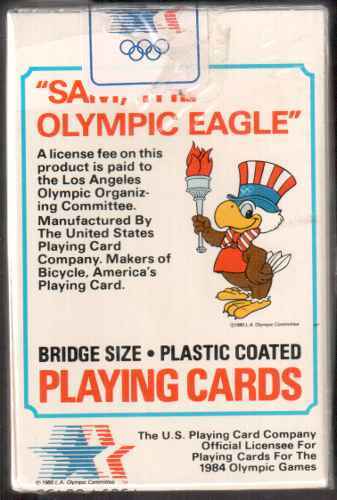 USA United States Playing Card Company Sam the Olympic Eagle 1984 Official Bridge Playing Cards for the 1984 Olympic Games. (USPCC Order No 0133) Special Ace of Spades with Olympic Logo. Complete 52 cards plus Joker plus Title plus Advertising cards. Original box sealed mint as new. Note: This is a variety of the third of the 5 different sets of Playing Cards officially issued for the games. Others are 1. Bicycle Olympics 2. Stars in Motion 3a. Sam the Olympic Eagle Patience size 4. Mint Medallion Set 5. Mint Olympics Set. 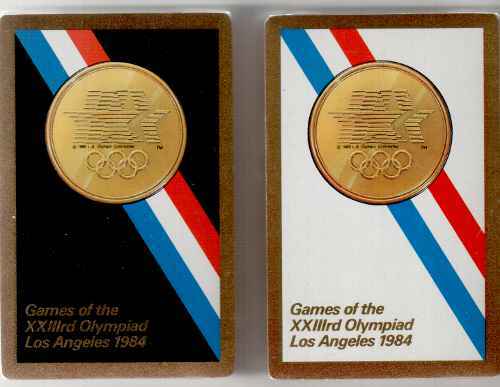 USA United States Playing Card Company Olympic Gold Limited Edition Congress Playing Cards Mint Medallion Double deck sealed with gilt edges special plastic box cards depicting Gold Olympic Medal white and black background respectively. 1984 Official Playing Cards for the 1984 Olympic Games. Special Ace of Spades with Olympic Logo. Complete 52 cards plus Joker plus Tile plus Advertising cards. Original double plastic box mint as new. USA United States Playing Card Company Olympic Gold Limited Edition Congress Playing Cards Mint Olympics Double deck sealed with gilt edges special plastic box cards depicting Male and Female Olympic Torch bearers respectively. 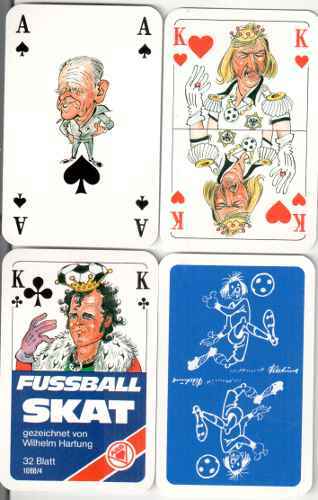 1984 Official Playing Cards for the 1984 Olympic Games. Special Ace of Spades with Olympic Logo. Complete 52 cards plus Joker plus Tile plus Advertising cards. Original double plastic box mint as new. USA United States Playing Card Company Olympic Gold Limited Edition Congress Playing Cards Mint Olympics Double deck sealed with gilt edges in special 'snap' elongated presentation case 'Congress Mint Editions' inside box cover. 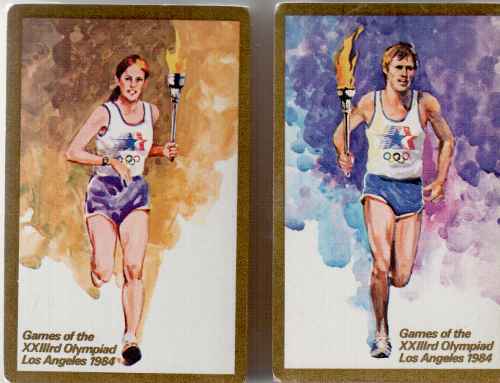 Playing cards depicting Male and Female Olympic Torch bearers respectively. 1984 Official Playing Cards for the 1984 Olympic Games. Special Ace of Spades with Olympic Logo. Complete 52 cards plus Joker plus Tile plus Advertising cards. Original box mint as new with protective outer cardbox.